After having had a "weather station" for some years that showed the outside temperature, barometric pressure, inside temperature and some corresponding minimal and maximal values, I decided that I needed something more “geeky”, something that can be analyzed afterward on a PC. Requirements were easy to describe: Must have sensors for temperature, wind and rain and must be usable under Linux. Finding the software part was easy: There seems to be nothing else in the open source world but wviewweather. This package was written and is maintained by Mark S. Teel. I'd like to thank Mark for his excellent work once again. Next task was to find a not too expensive weather station available in Germany and supported by wview. I wasn't really sure if the TFA Nexus (Kat. Nr. 35.1075) was indeed one of the wview's supported ones named as “nexus” - a Honeywell TE923 clone. I gave it a try and I was not disappointed. The TFA Nexus is fully supported from wview. No problems at all to get it running. Once I got my new TFA Nexus running with wview I realized some strange divergence between the rain amount shown on the Nexus base station and in wview's display. So I installed the wview sources, compiled everything myself, added lots of trace output just to find out: The Nexus doesn't report the millimeter amounts shown on the display, but the raw ticks sent by the rain sensor. That was the beginning of "jo's-te923-hack" of wview. Send me an email to jo639@sommrey.de if you have any questions or suggestions or if you found a bug. Applying this patch requires some knowledge of building packages from source, resolving missing dependencies and other stuff. If you are not familiar with this process: Hands off! The changes from this patch are neither bug fixes nor improvements to wview. They are just modifications that I regard as useful for me, but that will definitely break some other people's installation. I do not intend to make this patch part of the mainline code. They are in no way meant as criticism of Mark's work. I just took the liberty of modifying wview for my personal use. If you use this patch (or parts thereof) and experience any kind of trouble, remember: before reporting bugs to Mark, make sure they are reproducible in the un-patched version of wview. The rain measurement was my primary motivation to make some changes to wview. There was not really something to patch. The station reported “ticks” that were interpreted as millimeters. By setting the corresponding multipliers (rain and rain rate) to 0.70555556 (1/36 inch) this issue was almost resolved. However, from the conversion from millimeter to inches and back to millimeter inside wview, there was some precision loss. Therefore I changed this rounding in my patch. I'm not sure if this is really needed, but it doesn't harm. Please note that the rain tick amount of 1/36 inch is still a guess. But it seems to fit. As a wind force illiterate and a German native speaker I felt kind of uncomfortable with the verbal descriptions of the wind strength on the “weather summary” page. Therefore I added the numerical Beaufort scale values to the “Recent Beaufort Scale” shown on there. Wind speed and wind gust speed reported from the station with one digit after decimal point, but are stored as integers. Converting these to mph and back to km/h results in rather step-like plots. Changing the data type to float improved this a lot. The wind chill is discontinuous if the formula is applied for values of temperature and windspeed strictly in the range temperature < 50 F, windspeed > 3 mph. Extending the range to where windchill equals temperature makes the function continuous in both arguments. Finding these points isn't too hard in algebraic terms. However, I did this using wxMaxima, the script containing all the steps you may find here. The anemometer is equipped with a temperature sensor that is used to calculate wind chill. This value is contained in the data block sent by the station. Wview doesn't even decode it. To make use of this value I put the anemometer's wind chill into the extraTemp2. Extending the wind chill calculation as described above opens a way to revover the temperature measured at the anemometer from the station's transmitted wind chill and the one calculated within wview. Given a wind chill difference based on the same wind speed it is possible to calculate the difference of the underlying temperatures. The calculated anemometer temperature is stored as extraTemp3. As the TFA Nexus doesn't have an UV sensor, I disabled the reading of it and "freed" the UV field thereby. Putting the difference between the calculated anemometer's temperature and the standard outside temperature into the otherwise unused UV field offers a way to measure sunshine duration. Adding up the time when this value is above e.g. 2.8 K gives a good estimate of the sunshine duration. Changing the content of UV to a temperature difference required some modifications in graph generation. As with wind chill, the heat index is discontinuous when the heat index formula is used strictly for for temperatures above 75 F. Moreover, the heat index may even go below the outside temperature. for very low humidities (h < 44.6 %), the calculated heat index and the temperature intersect at a certain point above 82 F.
for medium humidities (44.6 % < h < 81 %), there is no intersection between these two curves. In the range 73 F - 82 F there is a point where the difference becomes minimal. for higher humidities (h > 81 %) there is again an intersection in the range 73 F - 77 F.
The calulation of these special points is somewhat difficult in algebraic terms. There are numerical estimates for 10 % ≤ H ≤ 100 % in heatindex.h. Using these numbers as the switching point from hi = T to the calculated value makes the function partly continuous and minimizes the step where it cannot be made continuous. The limits were calculated using wxMaxima and stored in common/heatindex.h Curve analysis and header file generation was again done using wxMaxima. The script to reproduce you can find here. Be aware that running this Maxima program will generate a file named heatindex.h in your current directory. To get a better understanding of the data sent by the weather station via USB, I added log entries for the data blocks sent by the device. This data may be decoded with something like perl. Look at te923Protocol.c for details. 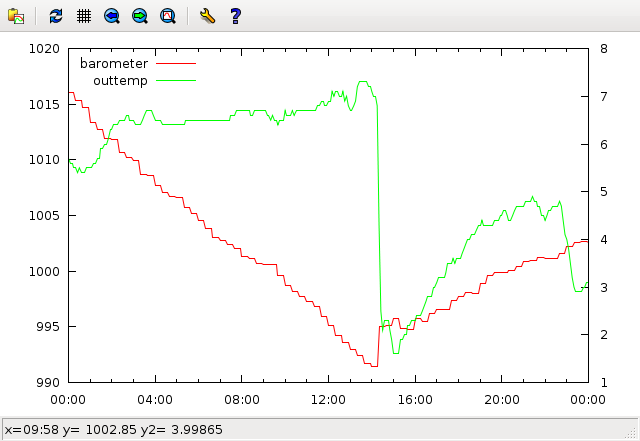 From the 5 possible temperature sensors only the first is recorded in the database. Since I have a second temp/humid sensor in use, I wanted to record these values too for further processing. The patch makes the values of an additional sensor on channel 2 available as extraTemp1/extraHumid1 in the database. 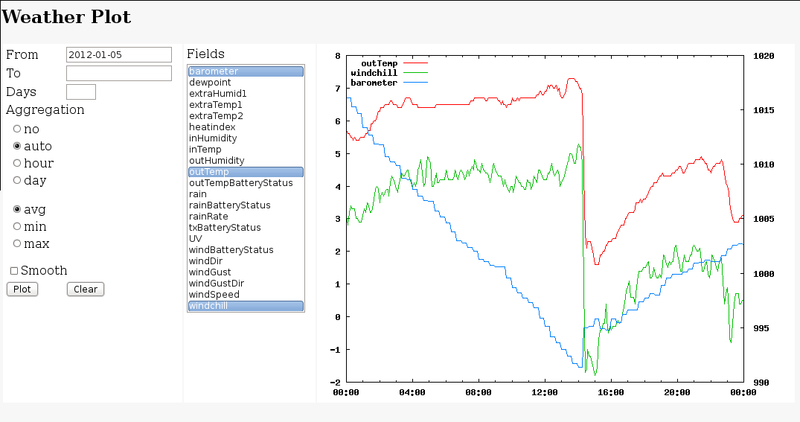 The status of the outtemp, wind, rain and secondary outtemp sensors are put into the database fields OutTempBatteryStatus, windBatteryStatus, rainBatteryStatus and txBatteryStatus. If your station is connected to some small device like a BeagleBoard or a RaspberryPi, you might want do access the station's data via the "virtual" station from a bigger iron. Not all available data are transferred via the virtual station and there are some specialties regarding NULL values. The te923-hack makes some modification in this part. Apply the te923-hack against wview-5.20-2 source and rebuild. Copy the data from the LOOP_PKT structure into the ArcRecStore in computedData.c. Wview comes with some utilities for exporting the data contained in the sqlite database to mysql. Based on this exported data I wrote some small programs to evaluate it. They are mostly dependent on each other but may be used independently with some modifications. Follow the steps described in the wview user manual to export your data to mysql. For the time being there's a bug in wview-mysql-export that prevents it from exporting noaa data after the initial export is done. After importing the sqlite data into mysql you get a one-to-one copy of the data. That is: Unix time stamps and US units. With a small set of mysql stored functions you may define database views that have convenient database time stamps and metric units. Run Metric-views as SQL script against your wview database. This will create views named table_m for all relevant tables. The same should be possible with the sqlite database without prior export to mysql. As I have all my databases running in mysql, I wanted to store the weather data there, too. Moreover I didn't want to make any changes in wview's databases. With the perl program weatherplot you can extract data from mysql and feed it into gnuplot. This may be used to visualize many combinations of one value against another. You can even plot more than two fields at the same time as long as they share units. Provide the mysql account data at the top of the script. For usage details see perldoc weatherplot. Store Weatherplot as /usr/local/bin/weatherplot and make it executable. The next step are two perl cgi-scrips weather and weatherplot that provide a web interface to the gnuplot generated images. The values that are selectable from this page are derived from the gnuplot wrapper script weatherplot. There's a list of valid names at the top of the script that you may modify to your needs. An example of an apache config file is provided too. Modify the apache configuration to your needs. In the form given it makes the weatherplot interface accessible as /weatherplot/ or /weatherplot/weather. If aggregation is set to "auto", no aggregation will be done for an interval of up to 3 days, hourly aggregation for intervals longer than 3 days up to one month and daily aggregation for even longer intervals. The From: and To: fields can be left blank or must be given in one of the formats "yyyy-mm-dd" or "yyyy-mm-dd HH:MM:SS". See perldoc weatherplot for a more detailed description of these fields and their defaults. with the pathes to all pages that are to be processed. It converts heights in feet to meters, it changes "meters" to "m" for visibility distances and it changes the "magic" 9999 m visibility to "> 10 km"